Super transparent polycarbonate, super slim convenience to carry in any pocket. super sturdy design yet with sufficient storage up to all kind of hooks and fishing lures, great size fitting for any fly fishing hook and lures. Transparent polycarbonate material for quick and easy identification of contents. smaller compartments, for nymph, dry, and emerger hooks. That would allow for twice as many slots too. Made using the highest polycarbonate quality components,it is very durability. It is great for all kind of fishing lure, fishing hook, or small fishing accessories. SUPER TRANSPARENT & SUPER STRONG: Made of Polycarbonate, PC, same material basically used for making bulletproof jackets in defense industry, high impact resistance. In fly fishing box history, most super transparent boxes are made of ABS, they are fragile. Later modified ABS indeed improves the strength. 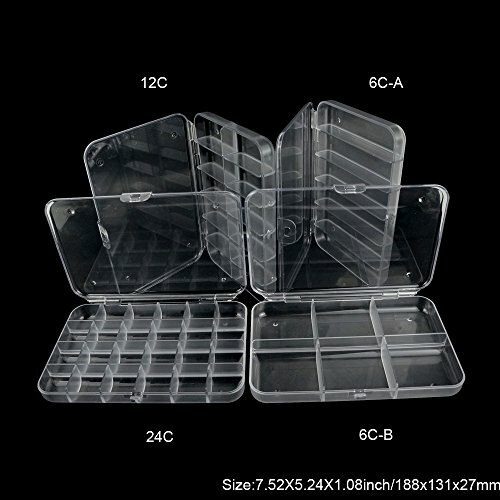 But Polycarbonate boxes are far superior in strength comparing with any ABS box. They are also far superior transparent than any PP box. They are difficulty to make, and NOT Cheap! GREAT FOUR DESGINES: 6C-A, 6C-B, 12C and 24C. They are designed to meet anglers’ different needs from small hooks, ice jigs or to large flies and lures. 6C-A suit full for most flies and lures. 6C-B, ideal for holding large flies such as tube flies, streamers and salt water flies. 12C more universal for all types flies. 24C great for nymph and beads heads. All these box bottom sides are beautifully curve shaped with compartment dividers, they greatly prevent slipping.